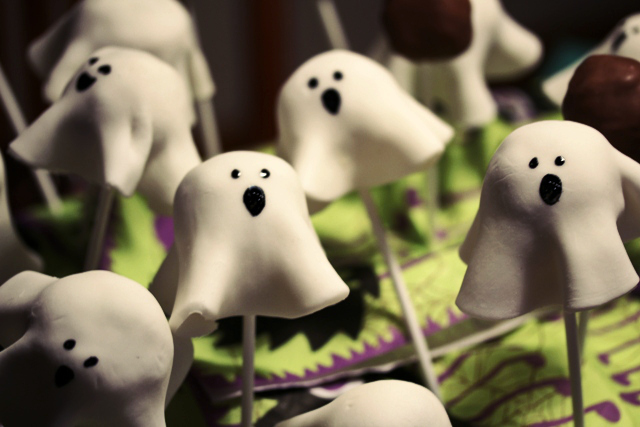 My last Halloween offering definitely wasn’t going to win any awards in the most attractive bake category (despite how much fun the kids had creating them), but these little spooky cake pops are much, much cuter. My daughter Jessie and I made these for her school bake sale and from all accounts they were a big hit. The girls say they’d all sold out before they even made it into the school hall. Cake pops are always a hit with children but I avoid making them too often. They’re not at all difficult, just a little long-winded and involved. So if you plan to have a go at these, do make sure you leave yourself plenty of time. The good people at Dr Oetker kindly sent me a big bag of ingredients in order to make this cake pops recipe, developed by Juliet Sear who is part of their Even Better Baking Team. The recipe is below and for more practical hints and tips, you can watch the video tutorial over on YouTube. The cake at the centre of these wee little ghosties is a delicious chocolate fudge brownie, which this recipe has you making from scratch. If you want to make life a little easier, you could always use a shop-bought chocolate cake – just make sure it’s a nicely moist and squidgy one. 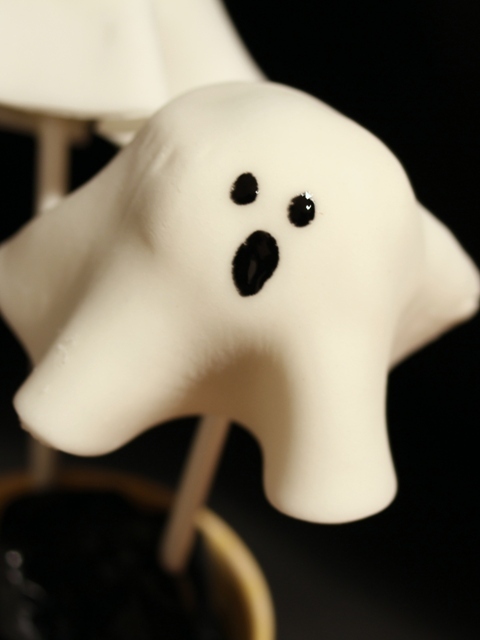 The brownie balls are covered in a layer of white chocolate, before being dressed in their ghostly regal icing robes. Preheat the oven to 140°C / gas mark 1). Grease and line an 18cm (7 inch) square cake tin. To make the fudge brownie mix, melt the extra dark chocolate in a microwave on medium power for 30 seconds at a time, stirring each time until melted, or in a heatproof bowl on a gentle heat over a bain marie. Leave to cool. 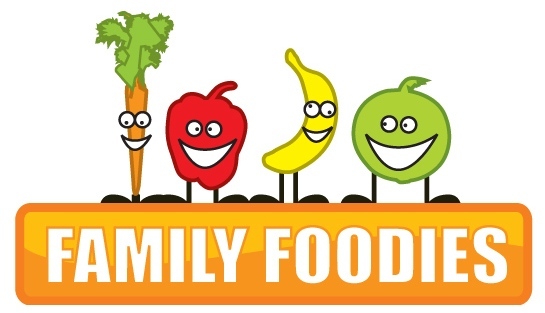 Gradually add the eggs a little at a time, mixing until combined. Add the cooled chocolate stirring continuously. Add the vanilla extract and stir. Gradually fold in the flour until just combined. Take care not to over beat. Pour the mix into your cake tin and bake for around 40 mins. Check it with a sharp knife or metal skewer. You want this to be slightly under baked, so the knife should come out with a nice paste stuck to the knife. Leave the cake to cool, then turn out into a bowl and crumble with your hands to a fine, fudgy crumb. To make the cake balls, take a handful of fudge cake mix and squeeze together tightly – you are aiming for little balls about the size of a large walnut, approximately 30g each. If the mixture is dry, the addition of a little melted chocolate or vanilla butter cream will help the mixture stick. Melt the white chocolate chips in the same way as the dark chocolate earlier. Dip the end of a stick into the melted white chocolate and push the stick into a ball, about half way in. Hold the ball to stop it splitting open when the stick goes in. Continue with all the balls. Once all the cake pops are ready, pop them into the freezer for 30 mins, so the balls are firm enough to hold when dipping in the coating. Keep the melted white chocolate in a warm place to stop it from setting. When the cake balls are firm, plunge each one into the white chocolate until completely covered. Tap the cake pop gently on the side of the bowl to shake off the excess. To decorate the ghosts, roll out half the white regal icing into a large rectangle using plenty of icing sugar and a large plastic rolling pin. Roll fairly thinly – 2 to 3mm thick. Squeeze a little Designer Icing onto the tops of the cake pops or brush with some melted white chocolate to keep the icing sheet in place. Using a cake cutter or small bowl, cut out circles of regal icing and place on each of the pops, smoothing down with your fingers to create the white sheet effect. Decorate each one with a ghostly expression using the black gel food colour and a fine brush. 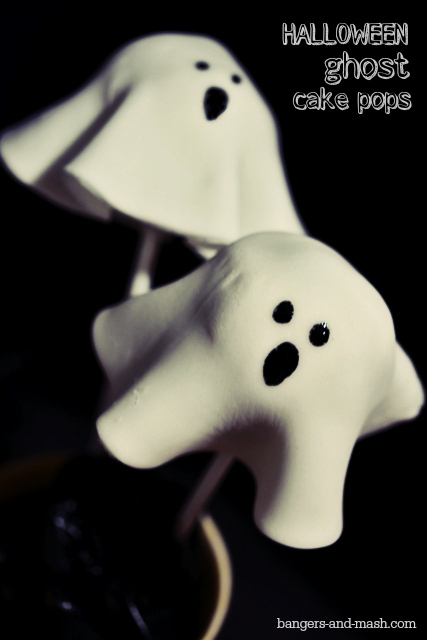 These spooky cake pops are perfect for making with little ones and so I’m entering them into this month’s Family Foodies ‘Cooking With Kids’ challenge, a month bloggers event hosted by Eat Your Veg and me, Bangers & Mash. Disclosure: I received complimentary ingredients from Dr Oetker in order to try out this recipe. No money exchanged hands and all opinions expressed are my own.